After much anticipation Canon has recently released their newest DSLR offering, the Canon 5D Mark IV. A follow up to their widely successful 5D Mark III, the Mark IV was announced preceding the Photokina trade show this year. It has been more than four years since the release of the Mark III, so everyone has been wondering what Canon has in store. It is true that cameras tend to have a longer useful life than other types of technology, but at the professional level there are a number of camera features that have become standard since the release of the Mark III. Examples include improvements in auto-focus systems, built in wireless, and 4K video. So how does the Canon 5D Mark IV stack up against its competition? There are plenty of good things to say about the Mark IV. Although, to be honest, it has spent so much time in development it would be awfully embarrassing for Canon if that were not the case! Let’s start with a list of some of the upgrades from the Mark III. The Mark IV is the first of the 5D camera series to sport Canon’s Dual Pixel AF technology. This technology dramatically enhances the photographer’s ability to stay locked on a moving subject and take running video. The Dual Pixel AF works with the touch screen in order to provide control over the speed that shifts between focus points happens. Additionally, the Mark IV also got a new feature Canon is calling Dual Pixel RAW, which allows you to tweak the focal point of an image after taking a shot. The 5D Mark IV also sports a number of upgrades to its video capabilities. The first, 4K, allows it to capture 4096 x 2160 footage at either 30p or 24p. The Mark IV has the ability to capture an 8.8 megapixel image out of previously taken video footage. This is a great feature for getting the perfect reaction stills and action shots. Additionally, the Mark IV comes with a slow-mo option that runs at 60fps for full 1080p HD and 120 fps for 720p HD. Another common feature the Mark IV incorporates is built in Wi-Fi. No more having to manually load in SD’s to your computer when you want to get your footage. The built in Wi-Fi feature also allows the pros to compete with event guests in getting pictures loaded online quickly. Another tech based feature of the camera is its built in GPS system. GPS lets you pinpoint your exact location when you snapped a shot. It also provides auto time sync information. As a result, you know the exact moment you took the shot with perfect light. Further improving on the Mark III, the Mark IV has a 30.4 megapixel full-frame sensor, compared to the 22 megapixel sensor on the Mark III. Also new with this model is an RGB + IR metering sensor operating at 150,000 pixels in order to improve facial recognition, as well as enhance motion tracking abilities. The Mark IV also comes with a pretty good ISO range, starting at 100 to 32,000, and stretching to 50 to 102,400 with expansions. Finally, the Canon 5D Mark IV adds a touchscreen interface, vibration control features around the mirror to minimize unwanted blur, and bokeh shift for when you want a bit of blur to spice up your images. It also includes audio jacks to improve sound quality. The Canon 5D Mark IV is not without its flaws. It suffers in a number of areas for various reasons. 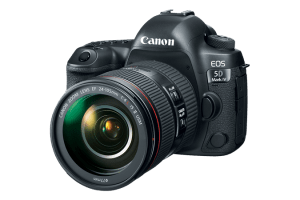 One particular area of note is in video technology, and this is largely thought to be because of Canon’s desire to set apart its 5D line from its EOS C line. As a result, some aspects of the Mark IV are a bit lacking. The first and most glaring example is the 1.74x crop factor when shooting in 4K. As a result of this it can be difficult to properly frame 4K video and produce reliable results. While this is fairly common, when you are buying a professional grade camera with 4K capability you would expect to be able to shoot in full frame. The workarounds available to DSLRs result in decreased low light performance and much more noise. The other option is a lens crop. Lens crops work great if you are planning on shooting video exclusively. However if you intended to alternate between stills and video swapping out the lens kit over and over again can get old very quickly. It is especially frustrating if you miss a shot. Another letdown in the Mark IV is the lack of C-Log. Although given the lack of this feature on the 1D X Mark II it is not a complete shock. The lack of C-Log does raise questions about how dedicated Canon is providing the highest quality product possible. Canon is notoriously unpredictable when it comes to post-release upgrades, so there is no way to know if they will add this feature. Footage is in a smaller, more compressed codec, and the ability to grade footage in post is hampered by the lack of C-Log. While the 4K video is nice, it lacks access to many features that professionals would want. For example, high frame rate, 100/120 fps, is limited to 720p quality. This means no slow motion 1080p or 4K video. The HDMI output also does not support 4K video. It only supports 1080p full HD. Additionally, while Canon has made progress in user’s ability to switch between focus points, it still only provides 61 focus points. This is a paltry number when compared to something like the Sony Alpha A7S II, which features 169. There are also issues with the Mark IV’s file production system. Using MJPEG, you can expect memory cards to fill up rapidly. Therefore you can plan on swapping cards constantly. Swapping is annoying when you are doing an event that requires a high volume of shots. Additionally, the MJPEG codec still only operates at 4:2:2, worse than its competition. While this is an improvement from the 4:2:0 of previous models, it is not in any way an advancement. Another file issue is the 4GB limit. While Canon does create a series of files shot your video run over 4GB, this solution only adds work in post. Other expected video features are lacking. There is no peaking. There is no zebras. No punch focus check. With a lifecycle of 4 years, Canon is at serious risk of being outclassed by its competitors. Don’t buy. While there has been much hype from Canon fans regarding this release, in reality it seems that Canon is playing catch up rather than trying to be an industry leader. Canon is still behind in a number of areas that are incredibly important to today’s shutterbugs. The biggest flaw is the crop factor. With the 1.74x crop factor you cannot shoot at a wide angle. Sony cameras have been able to do this for a long time. Additionally, the limitations on the 4K video mode are also extremely detrimental. Lack of a high fps in 4K, the inability to directly output 4K video, and codec and compression issues all work to undermine Canon’s case for the Mark IV. These limitations are incredibly important given that photographers are frequently asked to take video. Hobbyists also want more video options and use video at an ever increasing rate for things like YouTube, Vlogs, and more. Additionally, when the difficulties that the Canon creates for post with its limited run time and MJPEG codec are taken into account this decision becomes easy. Don’t buy the Canon 5D Mark IV.